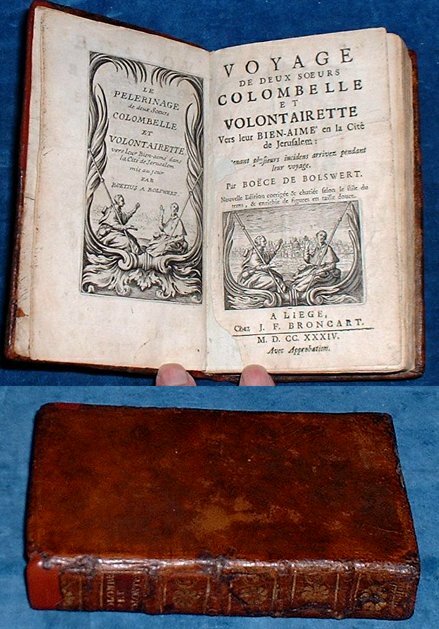 Title: VOYAGE DE DEUX SOEURS COLOMBELLE ET VOLONTAIRETTE Vers leur Bien-Aime en la Cite de Jerusalem: Contenant plusieurs incidens arrivez pendant leur voyage. Description: Liege, J.F. Broncart 1734 Frontispiece + copperplate illustration to titlepage of the two sisters & Jerusalem in the background + 27 full-page copperplates. . Small octavo brown calf spine gilt with spine label (top of spine and one corner repaired). Frontis +titlepage +pp dedication +262pp +pp index). Lacks 1 leaf P8 & last blank excised, 5 leaves torn without loss and 3 corners torn away but not affecting text. Name Emma Ippersiel 1864 on fly leaf, titlepage mounted with loss at gutter edge but not affecting printed area. *Imaginary journey and adventures of two sisters with very different temperaments travelling to Jerusalem, one having many accidents, which the plates amusingly illustrate.